We use this feature quite a bit here at Deswik. It still surprises me how many people don’t know about the DCF file format. Admittedly we could probably do more to make this feature more obvious! VDCL is the original Deswik.CAD file format. It works pretty much the same as a Word or Excel document. You open it and it loads the entire document into memory. When you save, it saves the entire document back to disk. DCF is different. It only loads the layers that were previously visible when you open the document. When you make a layer visible, it reads the data from disk into memory if the layer has not previously been loaded. When you save the file, only layers that were altered are saved. DCF has the potential to save significant time in opening and saving files. The format has been around for a couple of years now. I personally don’t use VDCL at all any more. 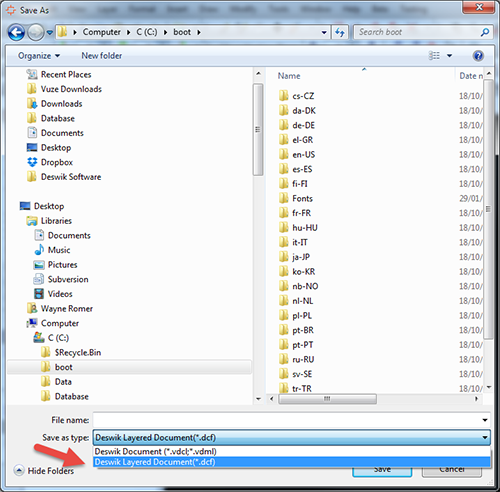 To convert your VDCL files to DCF simply select “File|Save As” and select the “Deswik Layer Document” option in the dialog. Did you know that VDCL stands for vector drawing compressed language? The Deswik.CAD files are an open XML format. However, XML (Extensible Markup Language) is text-based and uses a lot of hard drive space. For this reason we compress the data (hence the “compressed” in the name). DCF stands for Deswik.CAD File. It is also XML but each layer is internally parsed to a separate “file” within the compression.